Got an image you'd like to see in here first thing in the morning? Send it to tips@deadspin.com. Oh, baby, I got a show to do! That's Akihiro Gono in the middle there, making his entrance at UFC 94 at the MGM Grand Garden Arena in Las Vegas on Jan. 31. 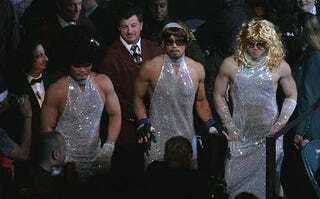 At least in boxing, guys like Oscar De La Hoya dress like this only in private. Surprisingly, Gono's opponent, Jon Fitch was not intimidated. Gono lost their welterweight bout. He is now dating Eddie Murphy. Some video of the entrance. Photo: Tracey Roman.